EOS cameras offer some ability to add metadata to digital images as they are taken. The metadata is added in the file, and can be read by many software tools. Metadata is used in photography as a term to describe additional information that is added to the digital file. 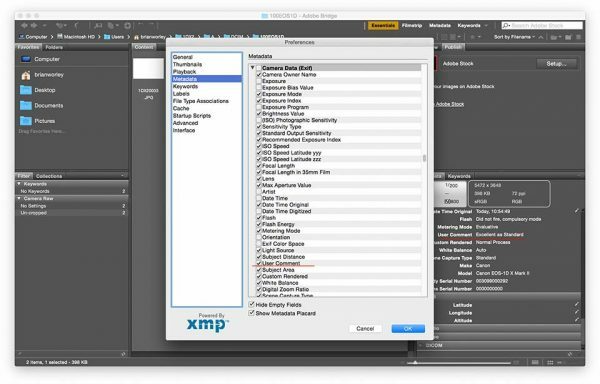 Sometimes the metadata is added in-camera, and for many photographers adding metadata is something that they do when filing, cataloguing and post processing their pictures. At the most basic level, the camera adds data to the file that describes the camera settings that were employed to create the picture; shutter speed, aperture and ISO are examples. However with the complexity of modern cameras and the ever increasing thirst for data the latest advanced camera allows much more than mere camera settings. The majority of EOS cameras have the option of adding a copyright notice in to each photos metadata as the photos is made. 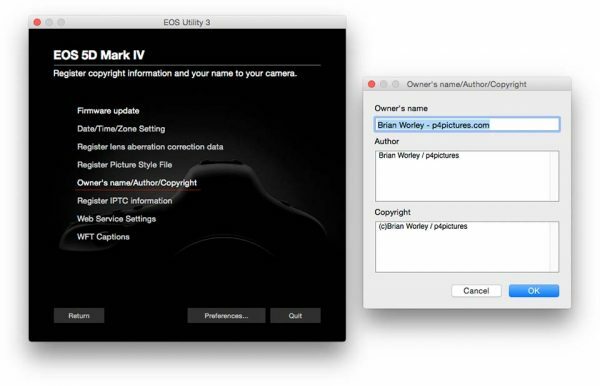 Often you can enter the copyright notice from the camera menu, you can also use EOS Utility too. There are just two fields, the author’s name and the copyright details. Once entered these are added in a standardised part of the image files metadata. Meaning they can be read by a lot of different software applications. If you’re eagle-eyed you’ll start writing to tell me there are three fields, it is true, but the Owner’s name is not shown in other software applications, apart from Canon DPP so it’s not regular metadata that’s widely readable. 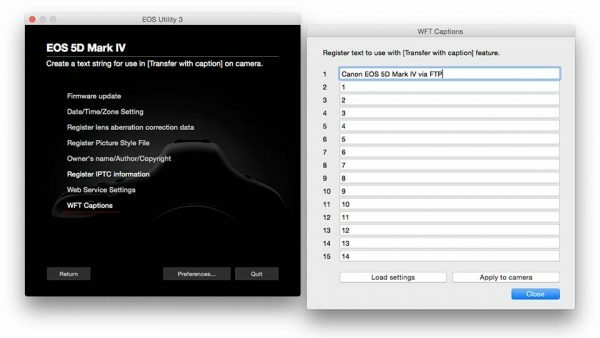 For many years the addition of a Canon wireless file transmitter has added the ability to choose one of 15 preset captions to be appended to an image prior to it being sent to an ftp server. With some forethought the 15 captions can be configured for many different purposes. If you do use these captions you need to make a small change to Adobe Bridge so that the captions are displayed with the other metadata. The EOS-1D X Mark II had a firmware update right after it’s launch to allow 39 standard metadata fields to be assigned in the camera. 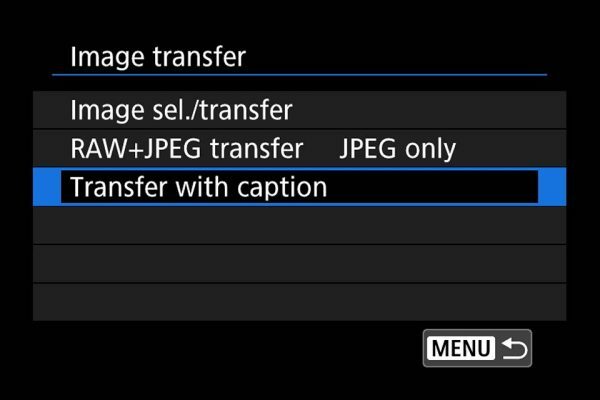 From the camera menu, the photographer can choose whether to add these fields or not using the custom functions. EOS 5D Mark IV included the same ability from its launch. The fields currently are configured when the camera is connected to EOS Utility. 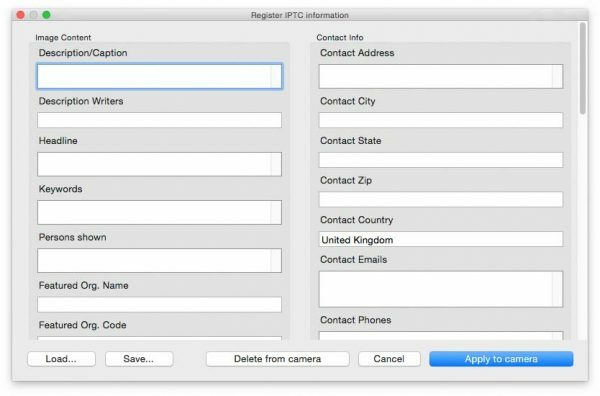 If you configure the user and copyright notice fields in the IPTC template then they will take precedence over the ones configured in the camera menu. I do wish it was possible to have several sets of IPTC data saved to a memory card and that I could load direct in to the camera from the card. The IPTC was established by a group of news organisations including the Alliance Européenne des Agences de Presse, ANPA (now NAA), FIEJ (now WAN) and the North American News Agencies (a joint committee of Associated Press, Canadian Press and United Press International) to safeguard the telecommunications interests of the World’s Press. Since the late 1970’s IPTC’s activities have primarily focussed on developing and publishing Industry Standards for the exchange of news data of all common media types. 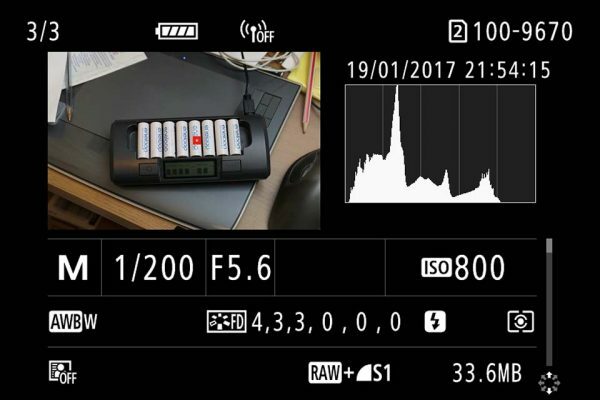 Is it possible on the Canon 5D-IV, when taking snapshots on the camera it will automatically download/display on the iphone (without having to transfer images from camera to phone) wirelessly? 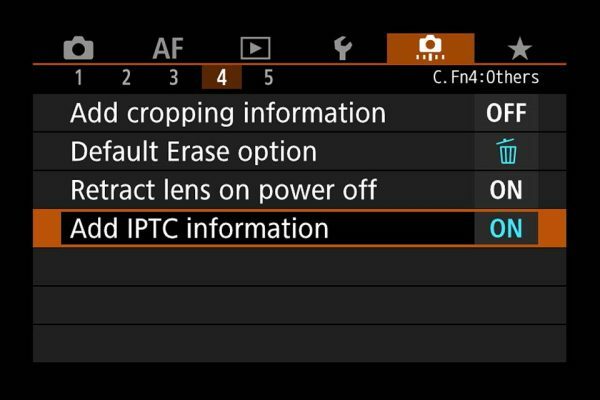 The reason I ask, Nikon has this feature and I don’t know if the 5D-IV has it too. This is not possible with the EOS 5D Mark IV and the standard Canon app. One possibility is to use something like the Shuttersnitch app on the phone as this does make it possible to auto transfer images, usually with FTP mode. Thank you for explaining this, I have a used 5D Mark III and the EOS utility isn’t compatible with my MacBook software. Reading a few other forum posts I wasn’t sure I’d be able to change the author from the camera’s previous user to my own, but your instructions showed me this wasn’t the case! So thanks, although I guess this is a classic example of why you should read the *whole* manual! Glad to be of help. If you have an old version of Mac OS then maybe the compatibility is an issue, but most modern versions are working fine. You can download the version for the Mac OS you have from Canon’s website for free, you don’t need to use the one on the disk with the camera. Visit https://www.canon.co.uk/support and enter the EOS 5D Mark III as the camera. I found a version of EOS Utility for Mac OS 10.6 right up to 10.13 and I’m sure that last one might run on 10.14 Mojave too, though I haven’t tried it yet. they tried opening the photos on Photo mechanic/Photoshop and the pictures appear without the date. Do you know what it could be the reason of that? The date/time on my camera is set. And the “Add IPTC information” on my camera is On.